Biodiesel has usually been made from the oil pressed from agricultural crops such as corn, soya, and rapeseed. However there is not enough arable land on the earth’s surface to grow sufficient corn to replace the amount of fossil fuel oil we use today, let alone tomorrow. There are alternatives such as Jatropha, an amazing plant which grows on the worst soils and has seeds with an oil content of well over 30%, but again enormous swathes of the planet’s land would have to be dedicated to growing this crop. What we need is an incredibly fast growing, biodegradable crop with enormous oil yields. Algae therefore came forward as potentially the most efficient crop to grow for biodiesel. It’s oil content is a whopping 50+% formed as it converts carbon dioxide from the air and sunlight into energy, and it has enormous growth rates. Studies (PDF document) suggest that algae is capable of yielding 30 times more oil per acre than the crops currently used in biodiesel production. Algae can create 5,000-20,000 gallons of oil per acre per year, far in excess of palm oil which yields a paltry 635 gallons despite being one of the best crops presently for biodiesel production. Algae can also be economically converted into solid fuels, methane gas, or bio-ethanol. It can also be used to generate electricity which in turn can be used to obtain hydrogen fuel to power hydrogen fuel cells. 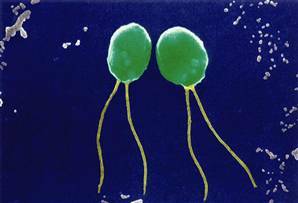 Another advantage is that algae can even be fed on liquid human sewage and on streams polluted by fertilizer run off reducing pollution. 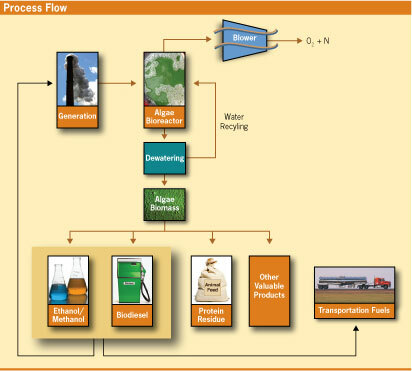 Pictured above is a schematic diagram showing the process flow from growth of algae to its processing into transportation fuels and its use to generated electricity. This scheme proposed by GreenFuel takes CO2 from smokestack emissions and uses it to feed the algae having the ancilliary benefit of reducing emissions – NOx by 86% and CO2 by 40%.